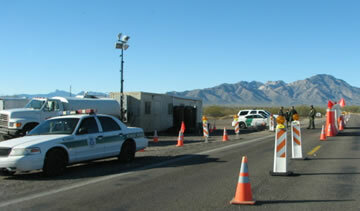 After a recent abusive experience at an internal Homeland Security checkpoint along I-8 in the Yuma Border Patrol Sector, Freedom’s Phoenix editor David Hodges recounts his experience below. Following Dave’s editorial appearing below, I provide additional information regarding Maricopa County Sheriff Joe Arpaio’s recent immigration sweeps in Guadalupe along with the involvement of Tucson Sector Border Patrol Union leadership. To Terry and Other Like-Minded Americans. I have been reading Terry’s excellent articles on the abusive behavior of many of federal officials as they man the roadblocks associated with border control. On January 3, 2009, at 11pm, while driving back from Yuma, on I-8, with my companion, I suffered the same indignity that Terry often speaks about. I have been waived through this I-8 border checkpoint over a hundred times without incident and that appeared to be the case as I approached the checkpoint and was told to proceed by the agent on my side of the car only to screamed at to halt by the agent on the passenger side of the car. I was told to pull over and exit the vehicle and to sit down. I asked what was the reason related to my detention. I was told to shut up. I was then told my vehicle was going to be searched and I asked what was the probable cause associated with the search. I was again told to shut up. I watched in horror as the drug dogs went through my car and in less than 10 seconds, it was over and I was told that I and my companion were free to go. I, again, repeated my question as to what the probable cause consisted of for my detention and warrantless search. I was told to “get while the gett’in was good.” At that point, my companion, Gil Lopez (an American teacher and a basketball coach) called me a “coyote” and told me to get into my car. It was at that moment that I realized my American friend of hispanic origin had been racially profiled and that was the true reason for our detention and illegal search even if the Border Patrol would not care to admit it. Joe Arpaio may not work at this particular checkpoint on I-8, but his racially profiling spirit is alive and well and is clearly providing the guiding light among the Border Patrol personnel at this particular checkpoint. I can now more easily empathize with Americans in Guadalupe as, last summer, they were racially profiled by Sheriff Joe and his Gestapo tactics. If the first casualty on the immigration problem is the United States Constitution, then we have already lost the war as well as many of our civil liberties, namely, the fourth and fifth amendments. I have a new appreciation for Terry and the valuable service that he is providing by shining the light of day on this abuse of American citizens. For those who don’t believe these misnomered ‘crime suppression sweeps’ weren’t about harassing immigrants, legal or otherwise, I’ve included entries recently appearing on the Local 2544 Border Patrol Union’s website (which have since been removed). In these entries, local union leadership first endorse Sheriff Arpaio for County Sheriff and then boast about personally attending Arpaio’s sweeps near Phoenix, AZ while meeting with Arpaio face to face. All the while claiming these operations and their involvement had nothing to do with rounding up immigrants. 06-25-08 “Local 2544 Executive Board Officers will attend parts of the upcoming crime suppression sweeps in Mesa. 06-28-08 “Local 2544 President Edward Tuffly, Executive VP Brandon Judd, and Treasurer George McCubbin spent Thursday afternoon and much of Thursday night with Maricopa County Sheriff Joe Arpaio and Maricopa County deputies, who were engaged in a crime suppression sweep in Mesa, Arizona.